"Humans have effectively created continent-size antennae - all exquisitely tuned to soak up currents caused by space weather" - John Kappenman of Storm Analysis Consultants, re the vulnerability of our massively networked electrical supply grids. He was quoted thus in the July 2012 edition of Popular Mechanics in an article titled Welcome to the Next Solar Maximum. Activities on our sun can effect profound consequences here on Earth, both in the form of communications disruptions and in the form of electrical supply grid disruptions. Both can be dire with the potential of crippling worldwide commerce. News agencies often refer to the violent spewing of copious quantities of high-speed electrons, protons, and neutrons as sunspot activity, but in fact, the phenomenon is termed coronal mass ejection (CME). Billion-ton belches of sun guts can be sent hurling earthward. Fortunately for us, not all CMEs are directed toward Earth, but enough do that NASA and the DoD (Department of Defense) have spent billions of dollars designing, bilding, deploying, and operating satellites and earth-based sensors in hopes of detecting incoming events with enough of a time warning to prepare for and mitigate the effects of the inbound tempests. John continues, "The physics of the sun and of the Earth's magnetic field have not fundamentally changed, but we have. We decided to build power grids, and we've progressively made them more vulnerable as we've connected them to every aspect of our lives." A significant enough storm can destroy power grid transformers along with connected equipment, and communications, sensor (weather, surveillance, etc. ), and navigation (GPS, Galileo, GLONASS, et al) satellites. Recovery times for worst-case scenarios can be measured in months or even years on a global scale. One of the most recent significant CME-caused crashes in the electrical supply grid occurred with Hydro-Québec's power grid going down on March 9, 1989. The 1989 CME was caused by an X-15 class solar flare that erupted three days earlier. Power generation utilities worldwide have implemented systems to help mitigate the chance of system-wide outages since then, but as we just learned in early August 2012 with India's massive blackout, significant unplanned-for vulnerabilities still exist with and without the assistance of a coronal mass ejection. The mother of all CME events occurred in 1859 and is known as The Carrington Event. The Carrington Event was the first documented event of a solar flare impacting Earth. It began at 11:18 a.m. EDT on September 1 and is named after Richard Carrington, the solar astronomer who witnessed the event through his private observatory telescope. He sketched the sun's sunspots at the time not realizing what was in store for the home planet a few days later. The flare was the largest documented solar storm in the last 500 years, even to this day, according to NASA scientists. There was no wide area power distribution system at the time. However, the country's telegraph systems did feel the impact. According to reports, telegraph operators were able to disconnect their equipment from the batteries and send messages via the "auroral current" inducted in transmission lines. There are currently only a handful of satellites orbiting both the earth and the sun who's raison d'être is to monitor and warn us of solar events that have a potential to cause problems. Two of our most important sun-monitoring satellites, the Solar and Heliospheric Observatory (SOHO) and Advanced Composition Explorer (ACE), are long past their respective design lifetimes. 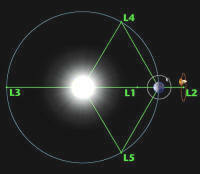 SOHO, the only sensor current in position in the L1 Lagrangian orbit directly between the sun and Earth, "looking down the barrel of the gun," may only have another year or so to go before it runs out of orbit-correcting fuel. Of course the instruments could fail at any time. ACE has fuel for another decade, but its instruments are also past the design lifetime, so all bets are off. It is in a Lissajous orbit similar to SOHO's, but that orbital path is not directly inline with the sun; therefore, the full force of an Earth-bound CME event cannot be directly measured. The diagram at the right indicates where the five Lagrangian orbit points exist, for any 2-body orbital system. In our case, mutual gravitational forces from the sun and the earth combine at those points to cause a satellite positioned there to exhibits an orbital period the same as and in sync with Earth's. Believe it or not, there was a replacement for the ACE satellite built, tested, and ready to launch (Deep Space Climate Observatory, DSCOVR) back in 2007, but due to budget constraints it has sat in mothballs awaiting funding for launch and long-term operational control. It would occupy the L1 orbital position to replace SOHO's service. Due to typical politics, funding proposals for useful - yea even critical - items like this often die on the debate floor because other politicians try to attach pork spending allocations (bridges to nowhere, midnight basketball, etc.) as riders, causing the entire bill to fail to get enough support. This is a long-standing bipartisan problem in the House and the Senate. Solar maximums and minimums follow approximately an 11-year cycle. The current solar cycle (#24) is due to peak in the summer of 2013. We have already received some real whoppers from it in 2012, and surely more are on the way. When the big one occurs, and it almost certainly will, it will be interesting to see how the blame game is played out amongst politicians and government institutions not just in the U.S. but worldwide. Of course if the event is dire and wide-reaching enough, that news might be delivered via Pony Express or the amateur radio operators who still have tube systems that could survive power line surges that would fry the solid state electronics in modern gear. It's not just an EMP (electromagnetic pulse) from a rogue nuclear attack that can take us down. Our old friend Sol can easily accomplish the task.